The SEC is getting more aggressive in halting crypto and "blockchain" fraud schemes. Less than three weeks after the SEC halted trading in The Crypto Company, a shell of a company which notoriously soared to an $11 billion market cap on nothing tangible, just an extension of the bitcoin mania, the market regulator on Monday cracked down again, announcing that shares of another Chinese blockchain technology company would be halted. Specifically, the SEC suspended trading in shares of UBI Blockchain Internet, a Hong Kong-based company that advertises blockchain programs and services. The market regulator said it froze trading of UBI shares because of potentially inaccurate information the company filed in its disclosures to the agency and "recent, unusual and unexplained market activity" around UBI stock since November. The trading suspension spans from 9:30 a.m. on Monday through 11:59 p.m. on Jan. 22. UBI Blockchain, whose market value tops $800 million, had been riding the digital currency frenzy to stock market glory despite posting no revenue and including a disconnected phone number in its filings with regulators according to Bloomberg. Founded in 2010 as JA Energy, the company - like so many others - changed its name to reflect its blockchain operations in November 2016. UBI was one of several companies involved or allegedly involved in blockchain or cryptocurrency technology that investors flooded with cash last year. UBI said it plans to harness blockchain so that consumers can “trace a food or drug product from its original source,” according to its SEC filings. As a result, shares of UBI jumped from $7.20 on Dec. 8 to $87 on Dec. 18 as cryptocurrency prices and equities in blockchain companies skyrocketed. At one point, the stock traded as high as $115 after selling for 55 cents last February. 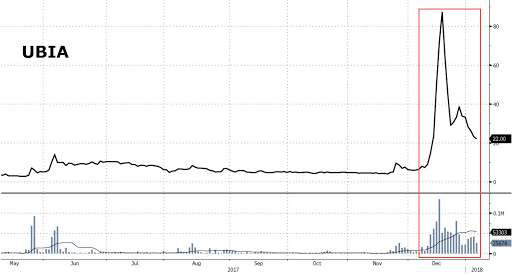 The surge made this over-the-counter stock one of the most-valuable public companies in the bitcoin universe. At least someone managed to take profit: UBI stock fell back to $22 on Friday, the last day of trading before the SEC freeze. And speaking of selling, Bloomberg reported on Dec. 27 that UBI registered to sell an additional 72.3 million shares owned by executives. It appears that for once the SEC stepped in before management could take advantage of even more greater fools. Recently, the SEC has warned investors last week of rampant illegal trading in cryptocurrencies and initial coin offerings (ICOs). The CFTC also announced last week that it will meet on Jan. 31 to discuss the trading of cryptocurrency futures contracts. The agency says that its technology and risk advisory committees will meet to discuss the self-certification process for such derivative contracts, focusing on “oversight, surveillance, and monitoring” of listed cryptocurrency derivatives.